NBA Players Reject Owners' Offer : The Two-Way The decision means it's possible there will be no professional basketball until the 2012-13 season. The sticking point: Sharing of revenue. National Basketball Association players have rejected the latest contract offer from the league's owners, The Associated Press and SI.com are reporting. And as the AP adds, "the decision likely jeopardizes the season," which has already been delayed. According to the AP, players are now in the process of disbanding their union. That's a step that, as Korva wrote on Friday, is not unexpected. Many players are reportedly upset with their union reps, saying they gave away too much to the owners. The key sticking point, as usual, is how to share money. In this case, it's basketball related income, or BRI. That's the revenue teams earn from ticket sales, TV contracts, and more. NPR's Mike Pesca explained on Morning Edition what players face. "If players don't accept a 50/50 split of revenue - remember, they were getting 57 percent of all basketball-related income last year - they've agreed to go down to as low as 52 percent," Mike said. "But the owners want a 50/50 split. And [league Commissioner] David Stern has said, if you don't take that 50/50 split, our next offer is going to be a 47 percent split." 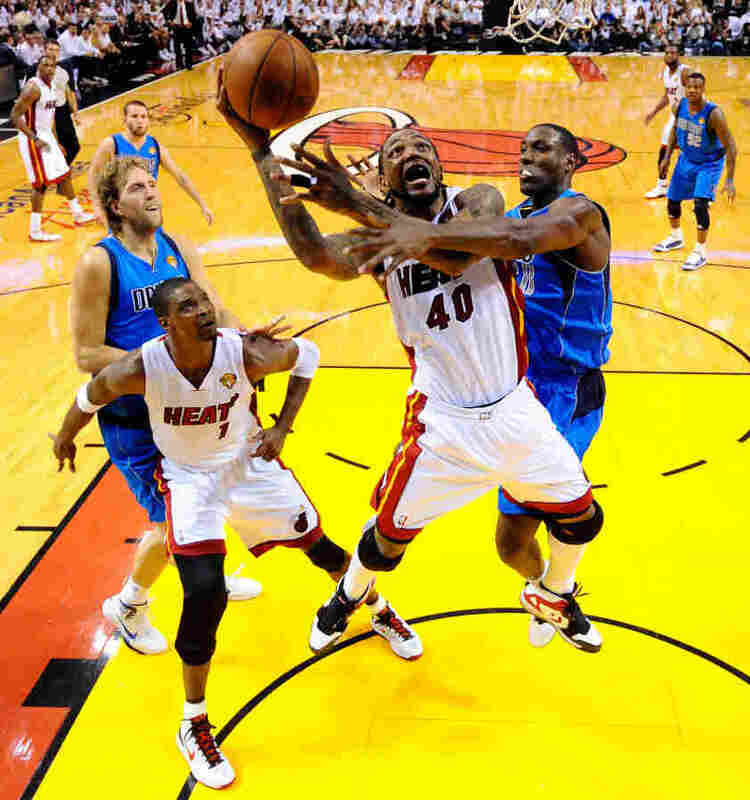 Fans may not see this kind of action for a long while: Chris Bosh of the Miami Heat as he drove to the basket in last season's finals against the Dallas Mavericks. All Things Considered's Melissa Block spoke to Gabriel Feldman, who is director of the sports law program at Tulane University. Feldman explained the reason the players' union is disbanding is because they weren't making any progress at the negotiating table, so they've decided to turn to litigation. Feldman said this is more a negotiating tactic on the players' side, because anti-trust litigation is drawn-out and expensive. Threatening litigation gives the players leverage. "What the players want is a quick legal strike," said Feldman. Feldman adds that taking this issue to court is "almost completely uncharted territory," so "no one can be completely comfortable" in their legal positions. Feldman said there is "so much risk in litigation" that he expects this issue to be resolved out of court. Is the season at risk? Absolutely. But Feldman says it's not as dire as some of the rhetoric would have you believe. "The chances of the season slipping away from us and the players losing that they have worked very hard to achieve ... it's really a tragedy," Stern added. He said the league had anticipated the union's actions, which was why it filed a lawsuit against the union and a complaint with the National Labor Relations Board earlier this year. "They seem hell-bent on self-destruction and it's very sad," Stern said. For its part, the union said its decision to reject the owners' offer was unanimous. "This is the best decision for the players," union president Derek Fisher told ESPN. "I want to reiterate that point, that a lot of individual players have a lot of things personally at stake in terms of their careers and where they stand. And right now they feel it's important — we all feel it's important to all our players, not just the ones in this room, but our entire group — that we not only try to get a deal done for today but for the body of NBA players that will come into this league over the next decade and beyond."